Feeling too lazy to make fried chicken? These crunchy parmesan and panko drumsticks are a quick and delicious alternative. Preheat oven to 425 F. Put a cast iron skillet in the oven. In a large, sealable plastic bag, mix together panko, parmesan, smoked paprika, garlic powder and salt. Put the drumsticks in the bag with the seasoning mix. Seal the bag shut and shake, toss and squeeze the bag until every drumstick is coated in the panko seasoning. Set aside. Put the butter in the hot cast iron skillet in the oven and let the butter melt completely. This will only take a minute or less – keep an eye on the butter so it doesn’t brown. Take the skillet out of the oven and swirl the melted butter around in the skillet. Put the drumsticks in the skillet, pushing them around and turning them over so they soak up most of the butter. Return the skillet to the oven and cook the drumsticks 20 minutes. Flip the drumsticks over and cooked about 20 minutes more, until the outside is browned and the inside temperature reads at least 165 F on a digital thermometer. 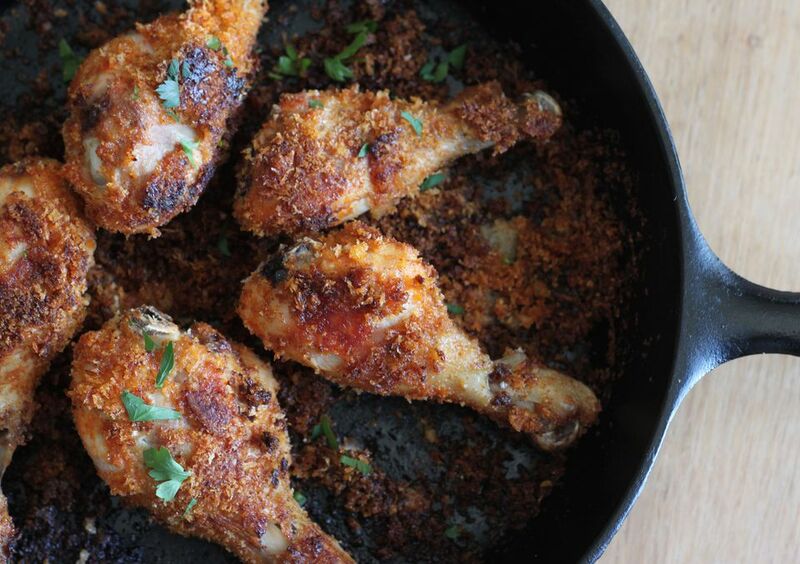 These parmesan and panko drumsticks are delicious hot or cold. However, they will be slightly less crispy after being refrigerated. Is there a difference between Parmesan and Parmigiano-Reggiano? Yes, and no. Within the European Union, Parmesan and Parmigiano-Reggiano are the same cheese. In the United States, Parmesan might be something other than real Italian Parmigiano-Reggiano. Italian PDO regulations (which stands for Denominazione di Origine Protetta or "Protected Designation of Origin”) state that the word "Parmesan" is defined as only genuine Parmigiano-Reggiano made according to Italian PDO guidelines. These guidelines outline where and how cheese labeled as Parmesan or Parmigiano-Reggiano is made. However, the United States does not enforce PDO regulations. Therefore, the word "Parmesan" is not regulated. A cheese labeled as Parmesan in the United States might be genuine Parmigiano-Reggiano, but it's more likely to be an imitation. For this recipe, Parmigiano-Reggiano or Italian Grana Padano will work well. American-made BelGioioso American Grana, Sartori SarVecchio Parmesan and other Parmesan substitutes can also be used. Panko are unseasoned, white breadcrumbs that are crunchy and often used in Asian cuisine. Regular breadcrumbs, either homemade or store-bought, are smaller and usually less crunchy. They can be made from white or wheat bread. Often, store-bought breadcrumbs have seasoning added to them.